You are here: Home > Blog > Is SEO digital snake oil? By Mark McGrath, June 2015. 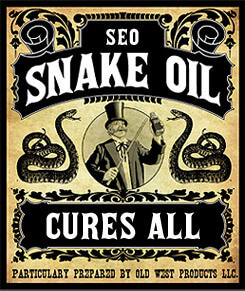 Is Search Engine Optimisation (SEO) digital snake oil? Well yes...and no. The growth of e-commerce and Google's dominance has created a questionable industry: SEO. With goldrush like fever, SEO agencies assault potential clients with desperate marketing. These agencies usually claim they can get them on the first page of Google's search results. Their wild claims are usually based on a magic SEO formula only known to them. It sounds like digital snake-oil. But is there anything legitimate about this? The short story here is this. No one can guarantee you the first page on Google search results. If an SEO agency promises you the first page of Google search results, then yes. You are being sold the equivalent of digital snake-oil. Then no. You are being offered legitimate services that can improve your search rankings. ...there is no magic bullet for SEO. Only skilled technical work, quality content writing and persistent marketing. Let's unpack both of these scenarios. Claim to know the secret 11 herbs and spices of Google's search algorithm. Promise they can boost your search ranking to number 1 or get you on the first page of Google search results. Offer this in a loud and desperate tone of voice for a cheap price. Think an online version of a late night infomercial. Spamming the web with comments and links. Publishing badly written articles (their idea of "content marketing"). Submitting your site to hundreds of fake directory sites (their idea of "linkbuilding"). Buying links from questionable or low-quality sites (their idea of an "online marketing campaign"). Stuffing your site full of keywords so that it resembles a version of online junk mail. Manipulating search engine processes to achieve higher search rankings ("gaming the system"). Hiding many of these tactics from you. These are known as "Blackhat" SEO agencies. Engaging these agencies will put your organisation's reputation at risk. It may even see your website blacklisted by Google. This would kill your web visibility to new users. Make sure your website is optimised according to Google's Webmaster Guidelines. Maintain a set of good quality social media channels with fresh, dynamic content. Regularly publish quality content that offers users genuine value. Provide web services that your target audience would find useful. Market your content to legitimate sites. These are sites that would be interested in your content (to get credible backlinks). Test and refine your content on an ongoing basis. This will help you increase the number visitors who take the action you want them to take. Such as sign-ups, purchases and service requests. Commission an SEO review. This will identify and resolve issues affecting your search engine performance. Each one of these tasks sounds simple but to do them well requires genuine expertise. Expertise that is worth paying for if you are not prepared to spend the time to learn how to do all this yourself. Market your content to legitimate and credible sites you think might be interested in your content (to generate credible backlinks). Continually test and refine your content to improve your conversions of traffic to your website goals (eg sales, sign-ups, quote requests). Commission an SEO review to identify and resolve issues affecting your search engine performance. Each one of these tasks sounds simple but to do them well requires genuine expertise. Expertise that is worth paying for if you are not prepared to spend the time to learn how to do all of this yourself. This is what is known as "Whitehat" SEO; legitimate practices to improve your search engine performance. The bottom line here is that there is no magic bullet for SEO. Only skilled technical work, quality content writing and persistent marketing. Mark McGrath is the Principal Consultant and Director of Social Change Media.